In an effort to provide more frequent updates for my loyal readers (my humble thanks to all three of you), I've decided to do the occasional review on books that I've been reading. They'll be short and to the point -- mostly about sf and fantasy because those are the types of books I like to read. 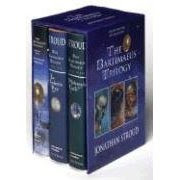 I'm kicking things off with a fun and breezy read, "The Bartimaeus Trilogy" (Book One: "The Amulet of Samarkand", Book Two: "The Golem's Eye", Book Three: "Ptolemy's Gate"). One of the best fantasy series I've read in a long time. The titular character is an "always too smart for the room" djinni in service to (he would say "enslaved"by ) ambitious magical prodigy, John Mandrake. Crisply written and laugh out loud funny in many places, these books explore a bizarre yet familiar world full of intrigue, powerful spirits, and exciting action.